Kennisland, Make a Difference Institute (MaD) Hong Kong and the HK Leisure and Services Department (LCSD) set up a social lab that explores how libraries can be more relevant spaces for citizens in Sham Shui Po, Hong Kong. During the second phase of the LIBoratory project, solutions for specific challenges will be prototyped. With a LabSprint in Hong Kong++LabSprint on homelessnessWatch our video on how the LabSprint on homelessness and loneliness in Hong Kong was run here. in 2015 and the start of a social lab in Vienna in 2016, Kennisland has been exploring the possibilities of using our Feed Forward Stories methodology in social labs in different cultural settings. Over the past years, Feed Forward has proven to be a valuable method for creating inclusive and democratised policy in the Netherlands. Cities like Nijmegen++NijmegenRead our publication with lessons from Nijmegen on doing research and making policy with citizens here (Dutch only)., Dordrecht, Schiedam and Amsterdam++Lab PracticeOur social lab in Amsteldorp, Amsterdam lead to the publication ‘Lab Practice: Creating Spaces for Social Change’ on how to organise and run a social lab. Find it here. have explored the social lab as a means to challenge their practices of policymaking and have formed multidisciplinary teams to research and actively create and test solutions for social challenges. 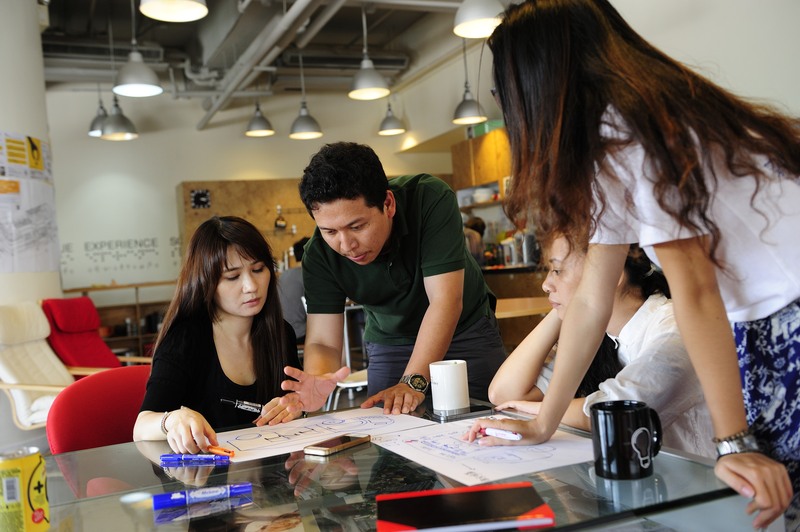 The Make a Difference Institute in Hong Kong focuses on inspiring and empowering young people from all over Asia to come up with creative responses to our times’ challenges. In last year’s LabSprint, 40 participants led by Kennisland worked intensively for two weeks on improving the lives of the homeless and elderly of Sham Shui Po – one of Hong Kong’s poorest districts. Based on this experience, MaD has decided to take Kennisland’s methodology to Hong Kong again for three six-month social labs over two years, starting with a lab about libraries.MaD has decided to take Kennisland’s methodology to Hong Kong again for three six-month social labs, starting with a lab about libraries. Kennisland supported MaD in this challenge as their programme partner, methodology guide and coach. Apart from one of today’s most important cities in the world nowadays, Hong Kong is also one of the cities with the highest income disparities worldwide. In the Sham Shui Po district, which has long been home to working class immigrants from mainland China, urban decay is visible everywhere and with a poverty rate of 18.2%, the district is officially the poorest in Hong Kong. Expensive, small and often non-A/C houses drive Sham Shui Po’s citizens outside into the public space. Libraries in the district function as a cool and quiet place for elderly to read the newspaper, for mothers to help their children with their homework and for lots of other visitors. With an absence of stimuli for innovation, however, the function of the library hasn’t changed much over the past years.Libraries in the district function as a cool and quiet place for elderly to read the newspaper, for mothers to help their children with their homework and for lots of other visitors. With an absence of stimuli for innovation, however, the function of the library hasn’t changed much over the past years. Although there is in basis nothing wrong with a traditional library that solely distributes and collects books, the question arises if libraries could take up more important functions for their surrounding citizens. The LCSD, directors of libraries and librarians, are actively searching for a way to engage citizens in shaping the library of the future – based on their wishes, needs and desires. Therefore, a multidisciplinary team of LCSD librarians, cultural managers, policymakers, designers, social work professionals and citizens started working on the challenge to create a truly public library that supports the neighbourhood in many different ways. The lab team kicked-off the LIBoratory project with an extensive lab training. During the LIBoratory project, the stories of citizens played a central role to define challenges in the neighbourhood and actions that need to be undertaken related to specific topics. Following the Feed Forward methodology++Feed ForwardFeed Forward is short for Feedback to go Forward and focuses on inclusive knowledge production and policy making. Read more about Feed Forward here., the lab team started collecting stories in and around the library to find out what the lives, challenges, dreams and visions of the people from Sham Shui Po look like. Their stories were published on a publicly available blog and shown during various community presentations in order to create a dialogue between citizens, professionals and government officials that might have never spoken to each other before. By not only sharing stories, but actively listening and engaging in an ongoing conversation that is fueled from multiple perspectives, specific challenges in the Sham Shui Po neighbourhood could be defined. Later in the process, the lab team focussed on those specific challenges by starting to generate ideas that can improve these situations together with the stakeholders involved. In the second half of the lab process, various ideas have been prototyped in the neighbourhood and/or the library to test and alter the initial ideas. After this prototyping phase, improved ideas that the neighbourhood gave feedback on, were ready for implementation. They will stretch the function of the current libraries and hopefully add a positive change to the living environment of Sham Shui Po citizens.